Recently I heard a speaker talk about what we need in order to have a better, more productive and fulfilling life. Nutrition starts with water. Unfortunately most people don’t drink enough water. Coffee, soda, or juice have sugar and other additives that greatly diminish the value of any water they contain. Our bodies demand pure straight water. Our bodies are 75% water, and if we aren’t drinking lots of unadulterated water it has several potential negative effects: head aches, fatigue, high blood pressure, skin disorders, asthma and allergies, high cholesterol, digestive disorders, bladder or kidney problems, constipation, joint pain or stiffness, weight gain, and premature aging. Equally important is eating good food. In our fast-paced lives we eat a great deal of processed fast foods. Foods that are high in sugar, salt, fat, preservatives, and other ingredients that inhibits our bodies ability to take full advantage of any nutrients they might have. I am not suggesting you become a vegetarian, but that you think about what you are putting in your mouth. Exercise is the second element in keeping you in balance. Going to the gym is good, but work with a trainer to be sure that you are doing the exercises correctly. Understand that some exercises can be harmful to your joints and back. Resistance exercises such as yoga, or utilizing those large rubber bands helps strengthen bones. Lifting weights helps keep our muscles toned and strong. According to the CDC a person should walk 7,000 to 8,000 steps each day. While most of us probably think we walk a great deal, the reality is that we don’t. Put a pedometer app on your phone and then look at it at the end of the day—you’ll probably be very surprised at how little walking you actually did. Mental strengthening is also required. Read constantly. Read books that will strengthen your mind. Not recreational books such as romance novels or Ian Fleming, but biographies, motivational books, inspirational books, business development books, or books about history or philosophy. Not only will these books teach you things, but they strengthen brain cells and can be very interesting. Besides exercising our brain, (and the brain is a muscle), it improves concentration, improves language skills, helps imagination, makes us smarter and even nicer. Carry a paperback with you wherever you go and read while standing in line at the grocery or while having lunch. It will be surprising how quickly you will be able to devour a book. Spiritual exercise is just as important as everything else I’ve talked about. Prayer and meditation reduce stress, helps us become emotionally stronger, spiritually stronger, and helps us become closer to God, (however you define God). Also read your religious texts as well as participating in the religion of your choice. Participating doesn’t mean go to church every week, it means actually practicing your religious beliefs constantly. I’ve known a lot of individuals who go to church every week, but the actual implementing and practicing of their religion stopped there. Showing up isn’t truly practicing a religion. Following the teachings of your faith twenty-four hours a day is. That isn’t easy, but is definitely worth the effort. 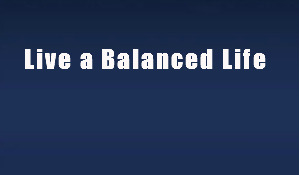 May you have a life filled with balance and harmony.